iOS 5 appears to unlock new 1080p capabilities for the iPad 2, allowing video in the 1080p format to be synced and played directly on the device. While the iPad 2 is of course unable to directly display full 1080p content on its own screen, many users are interested in outputting such content to larger screens, and it also opens the door to a true 1080p Apple TV. Yesterday, 9to5Mac reported that under iOS 5, Apple's video player will now play back and sync 1080p content. Cult of Mac now speculates on that development to suggest that Apple is preparing to support 1080p output on the next-generation iPhone and Apple TV, devices that will presumably be based on the A5 chip found in the iPad 2. What's interesting to us about this feature is that it implies that Apple is happy enough with the processing speeds of its A5 chip that they are going to enable 1080p video on devices with an A5 minimum spec. For right now, that's just the iPad 2, but come iOS 5's release in September, two other devices will fit the bill: the iPhone 4S and the next Apple TV. The current Apple TV, which is based on the same A4 chip found in the iPhone 4, is only capable of outputting 720p video, leaving some consumers hoping for more on a device that should be dedicated to a high-quality television viewing experience. 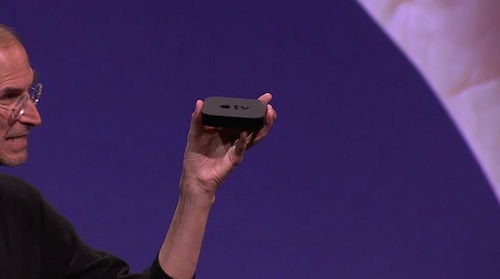 The original rumor regarding the second-generation Apple TV as an A4-based streaming device had pegged it as supporting 1080p and with 16 GB of storage. The released product does not, however, support the higher-resolution content and comes with only 8 GB of storage for the operating system and content caching. Apple's iOS devices have supported 1080p output in some form for several generations, with the iPad 2 currently able to generate 1080p graphics and output at that resolution to external displays. The device can not, however, officially support 1080p video files under the iOS 4.x software. Other users have been able to demonstrate 1080p video output on the iPhone 4 and even the iPhone 3GS, but the high-resolution content has not been supported through iTunes and the iOS devices' built-in video player from Apple. I don't consider apple serious about 1080p until they actually start offering it in their own itunes store. Lack of 1080p is the reason I don't have an Apple TV. I decided to wait until version 3, and now that I purchased an iPad 2 the other day, I'm looking forward to the new model even more. The ability to AirPlay and video mirror to my LG setup sounds great! iCloud on Apple TV is going to be equally fantastic. Will we even really need AirPlay most of the time? Our photos and videos will just show up on the AppleTV without any action on our part. Now that's slick. I've been having to create duplicate copies of all my home movies for years now. I'd love to be able to ditch all the 720p versions I've had to make to watch through my Apple TV. would anyone that actually has the tv 2 go out and buy the tv3, just because it offers slightly better picture? I bought the atv2 knowing that I'd have no second thoughts about upgrading the next year because it's only $100. That said, I'm not sure 1080p alone would be enough incentive to do so. I'll have to see what else it brings. I'm still hoping for apps on Apple TV, but AirPlay mirroring is a pretty good alternative. What that really shows is the absurdity of focusing on resolution as a meaningful statistic. So in a way that comic comes full circle to make fun of itself. If the point is that resolution doesn't matter that much, then the point of view of the comic (that people who like HDTVs are silly) is proven to be a silly point in and of itself. So is XKCD making fun of itself? Frankly, I find the whole thing too confusing to figure out. I don't consider consumers serious about 1080p until they actually own a 70"+ screen on which to display it. Exactly. On a 70" screen, the pixel density of 1080p is only 31.47 ppi. You would need to sit further away from the set than you would say, a 56" set with the same resolution (39.34 ppi) for it to look proper. That is to say, one can certainly appreciate the full glory of 1080p on a sub-70" set, even while sitting closer to the screen. Personally, I'll welcome the additional horsepower (and potentially storage) the 3rd gen :apple:TV will have. That said, I'll likely keep to high bit rate 720p files over 1080p. A 10-12GB 720p file gives me 85-90% of the picture quality (to my eyes) and 100% of the audio quality at 1/5 the file size. Storage is cheap, but not cheap enough to store 50+ TV series and 300+ movies at full resolution.